Some of the most valuable objects rescued as Notre Dame Cathedral burned in Paris on Monday evening are due to be transported to the Louvre Museum from the Hotel de Ville, where they were stored overnight, according to the French Culture Minister Franck Riester. At risk of being seriously injured by falling drops of molten lead, firefighters created a human chain to carry precious Medieval artefacts including the Holy Crown of Thorns and the tunic of Saint Louis to safety last night. “These treasures were saved thanks to a huge amount of courage by the firefighters of Paris working with the ministry of culture and city officials,” Riester said. A spokeswoman for the Louvre told The Art Newspaper it is too early to give details about which works the museum will temporarily house, or whether it will be involved in restoration, but confirmed it “is working closely with all competent authorities to help safeguard artworks that may have been affected”. 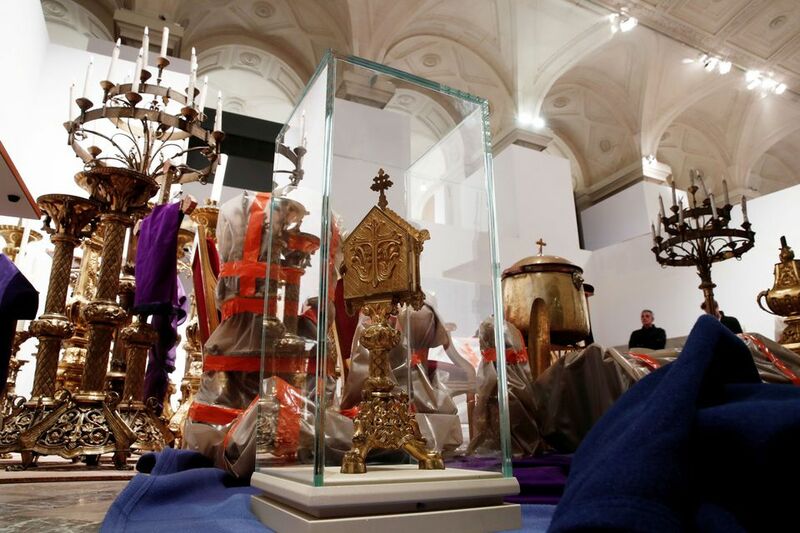 Speaking to French media today, Riester said the Holy Crown of Thorns, believed to have been placed on Jesus’s head during his crucifixion, and the 13th-century tunic of Saint Louis were transported to the Hotel de Ville on Monday night together with other works of art and religious relics. The condition of 14th-century carved reliefs by Pierre de Chelle, Jean Ravy and Jean Le Bouteiller remains unknown, while the stone statuary and gargoyles that adorn the cathedral are likely to have been affected. Earlier this month, 16 copper statues were airlifted and moved for renovation from the cathedral’s spire. Another slither of hope came this morning with images posted on social media that appear to suggest that all three rose stained glass windows, including the immense window to the north with original 13th-century glasswork, have survived–although the extent of fire damage is unknown. Christophe Girard, the deputy mayor of Paris in charge of culture, praised the collaboration between the city hall, ministry of culture and the Louvre in removing everything that could be saved. “It’s a tragedy not only for Paris, but for the whole world,” he said. Update: This article was updated to reflect the fact that all three rose windows now appear to have survived.